My dear mentor, Marc Williams, came to my house to do his thing! 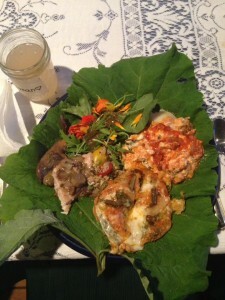 Which is to lead us on a Forage to Feast wild foodie event! In 2009 I attended a wild feast Marc hosted with his mentor, Frank Cook, and that began a wild fire that has been blazing ever since! Marc is a renowned ethnobotanist, wild plant authority, author and teacher extraordinaire, world traveler, gourmet chef…to name a few of his virtues. 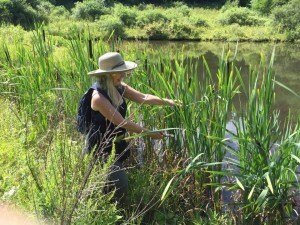 25 of us enjoyed his fascinating plant walk and then we all cooked up a storm with the wild edibles that I had been ‘buying’ from nature’s supermarket in preparation for this event in my wild kitchen. 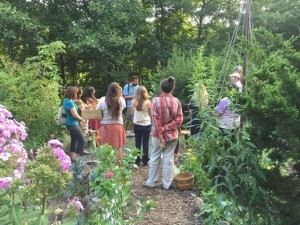 First, Marc led us on a plant walk around our land. Each person was given a recipe to be responsible for and to forage for. Marc’s talk added a new edible possibility to my bucket list: making nut milk from my Shagbark Hickory nuts! After we garbled our catch (my term for sorting our weeds), we cooked our entree for the big meal. 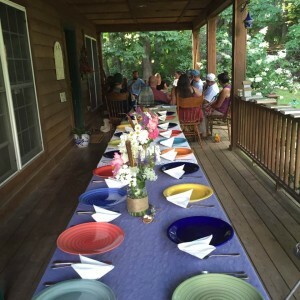 Finally, we feasted on nature’s bounty and enjoyed each other’s company as we sipped Dandelion root coffee, wild meads and enjoyed a Queen Anne’s Lace carrot cake for dessert. 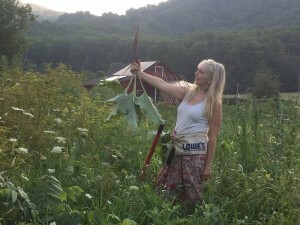 Pretty sure that everyone’s horizons were expanded as we rediscovered the green gifts that God has so generously provided for our food and medicine… reconnected to our roots and reclaimed some knowledge that will feed our bodies and spirits. 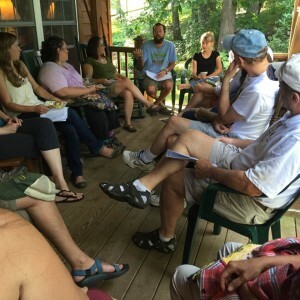 Getting to know each other’s stories and hearing Marc launch us into the world of wild edible weeds. So fascinating! Marc teaching us about the plants as we walked around my house. Interesting to note, that Lambsquarter is the weed responsible for turning him into a wild foodie! He spent an entire Winter making cold frames to grow spinach, tending the seeds and spacing them, cultivating and in the Spring the baby Lambsquarter was far more vibrant and abundant, 7 times higher in nutrition than Spinach and it was FREE. Sold! 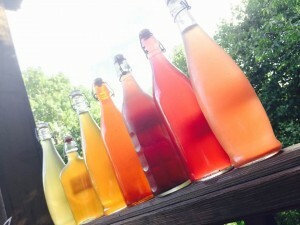 Preparing for a Forage to Feast is a bit like giving birth to a unicorn. It is a LOT of work. Fortunately, I love this kind of work and I have an artist husband who is always willing to go ‘shopping’ with me to an organic farm of grocery store for the photo ops it affords him. And Max (our Jack Russel terrorist) likes the adventure as well! 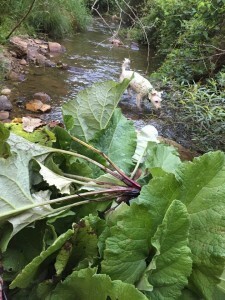 Shopping for Burdock root is WORK…but so worth it! I love this place! I love Cattail! Milkweed at the potato stage. I can never have enough! Stocking up for pickles and other goodies for the Winter. Once I am home with the free food the real work begins…. 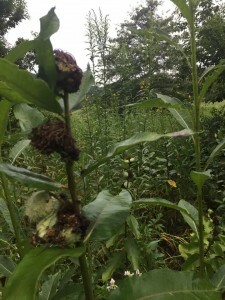 Garbling each wild edible, getting rid of buggy parts, a few bugs, yellowed leaves, anything that doesn’t pass my inspection. Then the roots need to be scrubbed, although this time I scrubbed the Burdock roots in the cool mountain stream which made it EASY! Max helped me cleaned the roots in the creek. I found that by shoving them point first into the sand it did a fine job of scrubbing! I will remember this! Everything is gathered, inspected, sorted, cleaned, bagged and then comes the preparation. 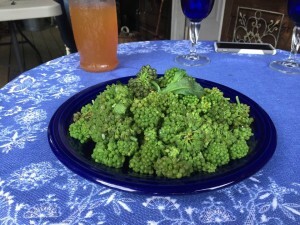 I made Elderberry capers with their green berries a week in advance of the Piccata recipe so they’d be pickled just right. 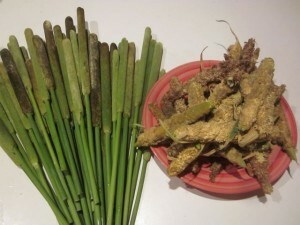 Marinated the meat of the green cattail flowers. Destrung the stringiness of the Burdock stems, Parboiled the Milkweed flower buds and pods so they’d be ready to cook with, made Beebalm, Peppermint, and Goldenrod tea from last year’s tea stash, Elderberry, Beauty Berry and Kudzu Flower Spritzers with water kefir grains. Cheryl came over the day before and helped me make the Wild Carrot cake and the Wild Seed Crackers. Thank you Cheryl! Milkweed flower buds ready to use in cooking. Boil for 3 minutes in salted rolling boil. These were used in our Spaghetti sauce. A cuisine theme of Mediterranean was chosen…so now to choose the recipes to feature the wild delectables in….all non wild ingredients need to be purchased…recipes need to be printed out for the cooks to refer to…stations need to be set up in my kitchen and porches to put all ingredients and utensils for each cook to have easy access to…. steeping teas need to be refrigerated…mason jars labeled with each name…the house prepared for guests…flower picked and arranged for centerpieces…table set…the welcome sign on the road…water boiled for the air pot… last minute phone calls of people canceling or asking it there is still room for a wild foodie to attend…. 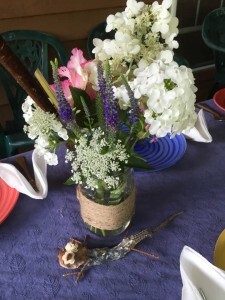 One of my wild apprentices, Hannah Hengst, arranged our centerpieces for the long table. She has that knack! Are you tired yet? And to think I used to do these Forage to Feast events once a month! Phewww! One of my MOs for cooking and eating well, is to have the table set in advance of the meal. Makes everyone think dinner is going to be awesome, even if I haven’t decided what to cook yet! 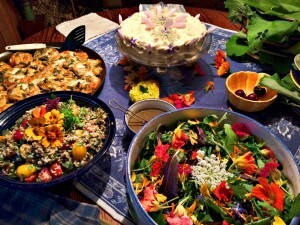 Just a few of our wild dishes: edible flower salad, purslane quinoa salad, burdock stem pizza rolls and wild carrot cake….the milkweed lasagna, chicken and portobello piccata and cattail polenta were on the stove and the drinks at the drink bar. 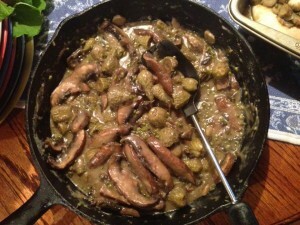 Portobello Milkweed Piccata with Elderberry capers! 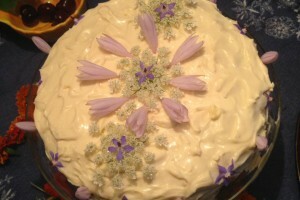 Wild Carrot Cake, decorated by Brook Brown with edible flowers. Brook also made the Queen Anne’s Lace jelly that I mixed with cream cheese and butter for the icing. Beautiful! Thank you everyone for the lovely evening! We were a team!! Thank you Marc for your wild wisdom and caring heart! Thank you God for the variety of green gifts that you have hidden for us in plain view! “We all wait for You to give them our food in due season. You open Your hand, we are satisfied. I am blessed by you and the wild fire that you stoked that night! You and Marc are both amazing teachers! Won’t be long before you are teaching Brook! You have been doing it girl! Proud of you and yours! And I thought I was a goood “cooker” from scratch! That looks awesome… Huge amount of work went into that I know! Come visit and I’ll turn you into a wild woman in no time. 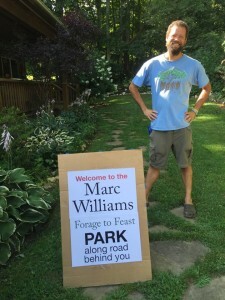 I’d love to come to the Forage to Feast with Marc this August! Any idea what the date might be?